We demolished and rebuilt a small rectangular kitchen in our last installment of the Kitchen Series. Today we have a 1956 galley kitchen that stretches the rectangle—but it is even more narrow than the 1943 version in Kitchen Series, 2 of 3. The evolution of kitchens across the decades shows many developments. Much of the functionality remains the same, but the materials and the idea of the kitchen has undergone major changes. The new kitchen with sleek grey and white semi-custom cabinets, hardwood floors, and high-end appliances. Advice from Mom: if you can’t think of something nice to say, don’t say anything at all. A tall ceiling and adjacent natural light were the best features of this kitchen before we started. Typical galley kitchens are out of favor because they are often outdated and too cramped for entertaining. Open kitchen plans are more popular than ever. However, any kitchen footprint can work well if other requirements are met—including galley kitchens. One valuable guideline is to avoid overwhelming the space with materials. Focus on the essentials and apply the editor’s maxim: have “the guts to cut” anything unnecessary. Think Hemingway, not Faulkner, in small kitchen design. A view of the Wolf dual-fuel range and backsplash to the ceiling with undulated tile. No upper cabinets clutter the space. Generous organized storage under the counter was sufficient for these clients. These clients subscribe to the “less is more” approach to kitchen design, and we agree. Numerous kitchens suffer from too many ornamental details (intricate cabinet doors, for example, to create the illusion of something “historic” or fancy) or over-styled finishes (hand-painted Italianate tile was popular at one time). Excess competes for your attention and ages quickly, too. Simplicity is not the same as plain. Wolf drawer microwave under white quartz countertops, Franke water filter, and Sub-Zero refrigerator shown above. This kitchen reminds us of the contemporary master bathroom we completed with the emphasis on uncluttered design, high-quality materials, and our focus on the short list of essentials for our clients. Do you know that feeling when you (pardon the expression) hit the nail on the head at work? We did here. It was a pleasure working with these clients, and it means a lot to us that they are thrilled with their new kitchen. We’ve defrosted after the bitterly cold temperatures, and we’re returning to kitchens we recently completed. 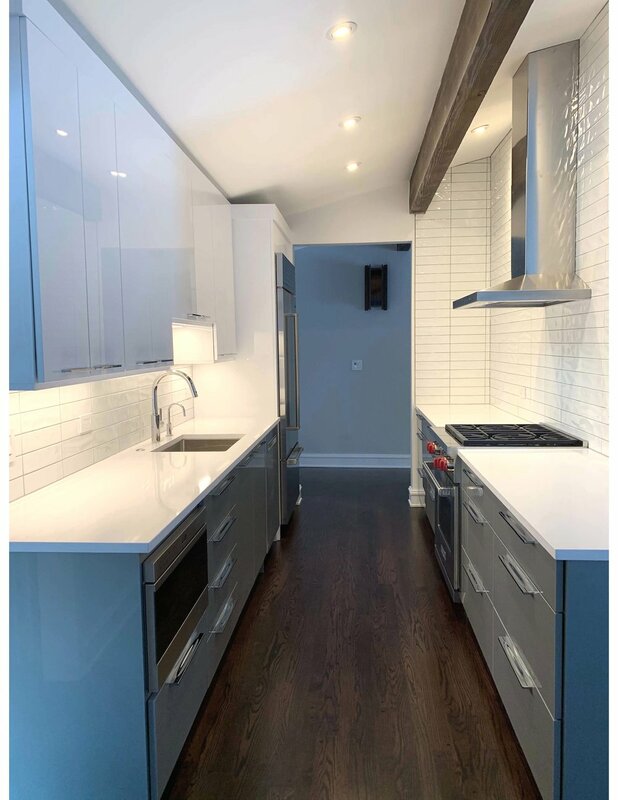 You can catch up on part 1 of the series which included a mid-sized new kitchen as part of a two-story addition in Wilmette. Now we find a smaller footprint in a Highland Park home. Our working dimensions are 9 x 15 feet. There is no good ability to expand without a costly addition to the house. Below is a picture of the renovated kitchen, followed by the “before” pictures. The new kitchen features Thermador appliances , a multi-function sink, and honed granite countertops. A prep sink does not fit in a compact kitchen, and a double-bowl sink is not as efficient as a single-bowl option. The client opted for a Julien Smartstation with included accessories (integrated cutting board, colander, and drying rack) for greater utility. The original kitchen was poorly designed with an “L” shape peninsula stub to hold the dishwasher. The original kitchen had tile flooring, basic appliances and cabinetry, and soffits that reduced the ceiling height for no obvious reason. One major design penalty arises from attempting to fit a peninsula or island in dimensions that do not support it. The owner ends up with a passage that is too tight for seating, and impractical storage or dead space are the result. Useful kitchen space is a top priority in general, and even more so in a compact footprint—rather than forcing a peninsula or island into a small kitchen design, it’s better to maximize the useful prep space and storage by eliminating one window in this example. Another view of the offending peninsula stub. We replaced the tile floor in the kitchen for red oak to match the rest of the flooring. The original cooking appliances opposite the sink wall. 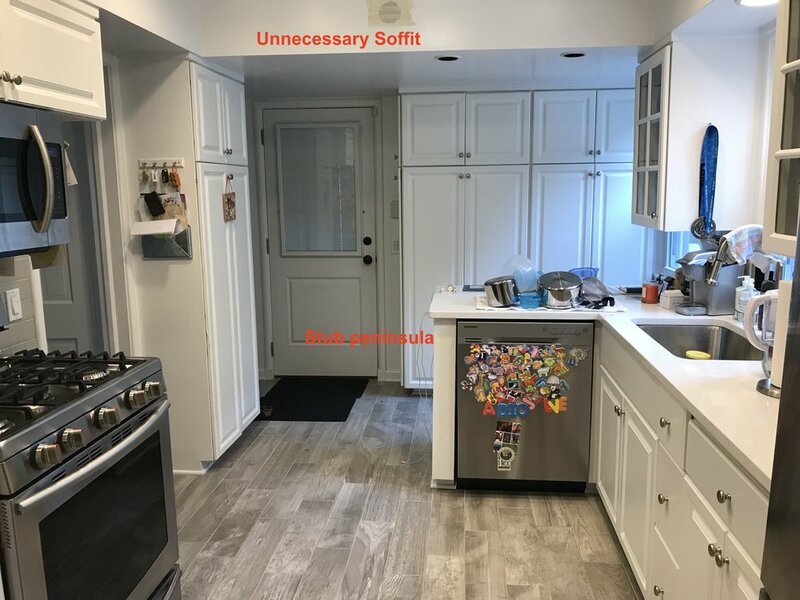 One disadvantage of stock cabinetry is that it can lead to odd configurations if the wall dimensions are not a good fit for the stock cabinetry dimensions. Semi-custom or custom cabinetry is a good choice for many kitchens.It allowed us to center the range on the wall and add valuable storage and prep space on both sides. A counter-depth refrigerator is preferable despite the additional cost, especially in a small kitchen. Like many of our clients, this homeowner has a full schedule with little time to spare for renovation plans. She was prepared to make a significant change to her home, and we are glad she entrusted us with this project—from initial consultation to completion. It’s satisfying to see a good plan come to fruition. We hope she enjoys her kitchen for many years!